Tables is a general name given to a class of board games similar to backgammon, played on a board with two rows of 12 vertical markings called "points". Players roll dice to determine the movement of pieces. Tables games are among the oldest known board games, and many variants are played throughout the world. The ancient Egyptians played a game called Senet, which belonged to the same family of "race games" as modern tables games, with moves controlled by the roll of dice as early as 3500 BC. The Royal Game of Ur, played in ancient Mesopotamia, is another member of the family. Recent excavations at the "Burnt City" in Iran showed that a similar game existed there around 3000 BC. The artifacts include two dice and 60 pieces. The set is believed to be 100 to 200 years older than the sets found in Ur. Though they are all race games they cannot be direct ancestors of backgammon. A game of tabula (Byzantine Greek: τάβλη) was played by Byzantine Emperor Zeno in 480 and recorded by Agathias in 530 circa because of a very unlucky dice throw for Zeno (red), as he threw 2, 5 and 6 and was forced to leave eight pieces alone and thus vulnerable. Roman Tabula (Byzantine Greek: Tάβλη) was nearly identical to modern backgammon; it was described in an epigram of the Byzantine Emperor Zeno (AD 476-481). The board was the same with 24 points, 12 on each side, players moved their pieces in opposite directions, and the dice were cubes as today. As in backgammon the object of the game was to be the first to bear off all of one's checkers, of which there were, as in backgammon, fifteen per player. Hitting a blot, reentering a piece from the bar, and bearing off, all had the same rules as today. The only differences with modern backgammon were the use of an extra die (three rather than two) and the starting of all pieces off the board (with them entering in the same way that pieces on the bar enter in modern backgammon). The same word (τάβλη) is still used to refer to backgammon in Greece today, where it remains a popular game played in central village squares (plateias) and coffee houses. The τάβλη of Zeno's time is believed to be a direct descendant of the earlier ancient Roman Ludus duodecim scriptorum ("game of twelve lines" or, better, "game of twelve signs") with that board's middle row of points removed, and only the two outer rows remaining. Ludus duodecim scriptorum used a board with three rows of 12 points each, and the pieces were moved across all three rows according to the roll of three dice. The earliest known mention of the game is in Ovid's Ars Amatoria (The Art of Love) (written between 1 BC and 8 AD). In the 11th century Shahnameh, the Persian poet Ferdowsi credits Burzoe with the invention of nard in the 6th century. He describes an encounter between Burzoe and a Raja visiting from India. 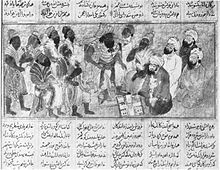 The Raja introduces the game of chess, and Burzoe demonstrates nard, played with dice made from ivory and teak. In 1254, Louis IX issued a decree prohibiting his court officials and subjects from playing dice games. 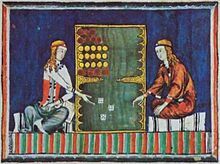 While it is mostly known for its extensive discussion of chess, the Alfonso X manuscript Libro de los juegos, completed in 1283, describes rules for a number of dice and tables games. In English, the word "tables" is derived from Latin tabula. Its first use referring to board games documented by the Oxford English Dictionary was circa AD 700. Tables should not be confused with Tafl, an unrelated class of board games (albeit linguistically related) played in medieval Scandinavia. Tâb and tablan (as well as the related games sáhkku and daldøs) may, on the other hand, be descendants of tabula. The game known in the West as backgammon is played widely in the Middle East and Central Asia. It is known as ifranjiah in Arabic (meaning "Frankish"), and is referred to as takhte nard in Iran. In many Arabic speaking countries, the game is known as "shesh besh", which is actually a combination for the sake of the rhyme of Persian "shesh" (six) and Turkish "besh" (five). Modern day Hebrew has borrowed this name from Arabic and backgammon is also called "shesh besh" in Israel. The name nardshir comes from the Persian nard (Wooden block) and shir (lion) referring to the two type of pieces used in play. A common legend associates the game with the founder of the Sassanian dynasty, Ardashir I. The oldest known reference to the game is thought to be a passage in the Talmud. Many of the early Arabic texts which refer to the game comment on the debate regarding the legality and morality of playing the game. This debate was settled by the eighth century when all four Muslim schools of jurisprudence declared the game to be Haraam (forbidden), however the game is still played today in many Arab countries. Mahbusa means "imprisoned". Each player begins with 15 checkers on his opponent's 24-point. If a checker is hit, it is not placed on the bar, but instead, the hitting piece is placed on top, and the point is then controlled by the hitting player. The checker which has been hit is imprisoned and cannot be moved until the opponent removes his piece. Sometimes, a rule is used that requires a player to bring his first checker around to his home board before moving any others. In any case, a rapid advance to one's own home board is desirable, as imprisoning the opponent's checkers there is highly advantageous. Mahbusa is similar to tapa. tawlet zaher, meaning "table of dice". An interesting feature of tables play in some Arab countries is that Persian numbers, rather than Arabic ones, are called out by a player announcing his dice rolls. People in the Iranian plateau and Caucasus region, especially in Azerbaijan, Iran, Armenia, Georgia, Uzbekistan and Russia, are very fond of playing narde. All 15 of a player's checkers are initially positioned on his own 24-point, but there is a major difference. One is forbidden to put his checker at a point occupied by one's opponent's checker, so there is no hitting or imprisonment in the long narde game. The main strategy is to secure playing "big pairs" by one's own checkers and prevent as much as possible doing the same by the opponent. The game is known as 'Fevga' in Greece, 'Moultezim' in Turkey, Mahbusa in the Middle East and 'Ifranjiah' or Frankish in Arabia. It can also be spelt as 'Nard' or 'Nardi'. A version known as short narde is a simplified form of Ifranjiah. In Georgia, ifranjiah is played as elsewhere, but called "nardi". In Georgia, Armenia, Azerbaijan and Russia many experienced players also play long narde, which some see as requiring deeper strategy. Gul bara, sometimes referred to as "rosespring backgammon" or "crazy narde", is a variant where there is no hitting. 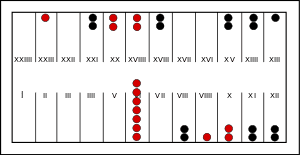 Portes closely resembles backgammon, with minor variations: there is no doubling cube, and a backgammon counts only as a gammon (called diplo, Greek for double). Plakoto is very similar to the mahbusa or tapa game. It has some general similarities with Portes, with different initial placement of the pieces and with pinning of blots instead of hitting them out. Fevga is similar to narde or the Turkish variant moultezim. There are no blots, therefore a point is blocked to the opponent even when occupied by a single piece. The three games are normally played consecutively, in three-, five- or seven-point matches. There are also other variants like Sfaktes which means slayers, and Evraiko (Jewish), a much simpler game depending entirely on luck with no room for skill. There are two games known as sugoroku (双六) in Japan. One more closely resembles Snakes and Ladders, while the other is played on a 24-point tables board, using standard tables equipment. The starting position is identical to that of backgammon. It differs from most other tables variants in that the pieces are never borne off. Additionally, the use of primes is not permitted. In Romania, tablă (meaning "board", cognate of the Latin tabula) is similar to backgammon, with two variations: there is no doubling cube and a backgammon counts only as a gammon (called marţ). Matches are usually played to three points. 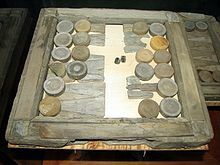 Brädspel ("board game") game recovered from the Swedish 17th century warship Vasa. Bräde or svenskt brädspel ("Swedish tables") is a variant played in Sweden. Players starts with all 15 of their checkers on opposite corners of the board, and play around counter-clockwise. Besides bearing off, there are several other ways to win, such as arranging all of one's checkers in certain pre-determined patterns, or by hitting so many checkers that one's opponent can not bring them in again. Additional points are awarded for a victory while one's opponent has checkers on the bar. Brädspel is played without the doubling cube. Interest in brädspel experienced a resurgence following the recovery of a 17th-century board from the wreck of the Vasa. 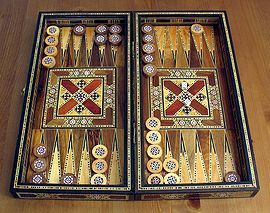 Tavla (from Medieval Greek τάβλη or from Arabic "tawleh"), is a tables game in Turkey very similar to backgammon. The major difference is in tavla the doubling cube is not used. Also in tavla both gammons and backgammons are counted as two points called mars and the players are not allowed to hit and run in their home boards as in backgammon. Matches are usually played to five points. There are many variants of tavla in Turkey, where the course of play changes drastically. The usual tavla is also known as erkek tavlası meaning boys' or men's tavla. The other variant kız tavlası (meaning girls' tavla) is a game which depends only on the dice and involves no strategy. There is another variant called asker tavlası (meaning soldiers' tavla) where the pieces are thrown to the board randomly and the opponents try to flip their pieces over the opponents' pieces to beat them. The player with no pieces left loses the game. This variant doesn't involve dice at all and the play depends more on hand-eye coordination than tactical decision making. Üniversite tavlası (university tavla) is a variant of the game played with two or more tavlas and four or more players, with the players forming groups. The dice are thrown only by two opposing players and the rest must play the same dice. If a team member gets beaten and cannot enter, his team mates cannot play for that round. Although the dice are the same, the game on every board differs interestingly, where the case of one team member winning and another losing is very common. This variant is considered much harder because the player must take more than one play into account while only being capable of making decisions on his own board. Hapis (Turkish for "prison") is another tables game played in Turkey. It is very similar to Mahbusa played in the Arab World. In backgammon, two players move their pieces in opposing directions, according to the rolls of dice. The use of a doubling cube allows players to increase the stakes of the game. The basis of the modern game can be traced to Medieval and Renaissance sources. 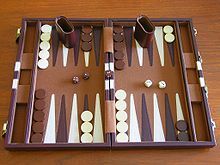 Backgammon has been studied considerably by computer scientists, who have developed software that plays at the level of top human players. Tric-trac is a French variant of Backgammon. There are two main forms of the game, le Grand Tric-trac and le Petit Tric-trac. In Tric-trac, the starting point is called a talon, the points, or fleches, are numbered to 12 on both sides of the board, with the 12th point on either side called the coin de repos, or, simply, coin. The 11th point (on either side) is often called le case d'écolier, or 'schoolboy's point' (case meaning 'square', literally) after the tendency of inexperienced players to rush to this point too soon in the game. Statistically, the most difficult points in the game to reach aside from the coins are the 8th points, and they are named les fleches de diable, or 'the Devil's points', for this reason. The home boards are referred to as the jan de retour by either player. Doubles are treated as two identical numbers, unlike backgammon proper. Many of the ancestors of modern tables games are no longer widely played. Irish, 16th and 17th century British game; directly ancestral to Backgammon. Tabula, 2nd century Roman game. Ludus duodecim scriptorum, Roman game dating back to the 2nd century B.C.